Since 1885, our college has made enormous strides in meeting specific needs of both students and patients, exploring new frontiers in drug discovery and development, pharmaceutical sciences, and translational clinical research. These labors have led to more than 40 patents in the past five years for treatments ranging from cancer to heart failure. Here at the college, we value innovation, learning and the advancement of knowledge. We value research and its application toward improving the use of medications in society. We value pharmaceutical care and professionalism. We value diversity in all of its forms. And we value our students, faculty, staff, alumni and friends like you. Without our core values, our college could easily be a school much like any other. Instead, we continue to grow, even thrive. 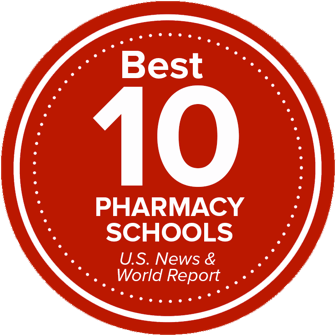 We are a renowned leader in pharmaceutical education, research and clinical practice. We are part of one of the most comprehensive health sciences campus in the nation. And we are consistently ranked as a top ten school in the nation, and by extension, the world. Our outreach has fueled exciting initiatives. Our Generation Rx prescription drug abuse program, our corporate partnerships with local pharmacies, the Partner for Promotion Campaign and our massive open online courses that help educate thousands wherever they live have all helped the college affect change throughout our changing world. I encourage you—whether a prospective student, current student, or alumnus or alumna— to discover all our college has to offer.